Over the years I have done things, been places and seen things that have amused or entertained me. Sometimes something just makes me think. I have always wanted to write things down because explaining things to someone else helps me understand something more fully. Often, when a thought comes to me, there is no one around to explain it to; or the timing just doesn’t fit. So I am starting this to write my thoughts. Simply for my own personal reasons, because after all, you must amuse yourself, no one else is going to do it for you. While you read you may read a story which refers to ‘them’ and ‘they’ instead of ‘him’ or ‘her.’ While considering writing a blog I was worried about embarrassing, or angering, friends and family. (I am not known for being couth so I really try to pay attention to what I say and how I say it. This is often a pointless exercise.) Ultimately I decided that, if asked, I would say these things to them directly, so why not blog about things. I will do my best to keep everyone anonymous however. Most of my posts will be done via the WordPress smart phone application. Please feel free to let me know if I have mistyped. I would rather be corrected than to silently look like a fool. 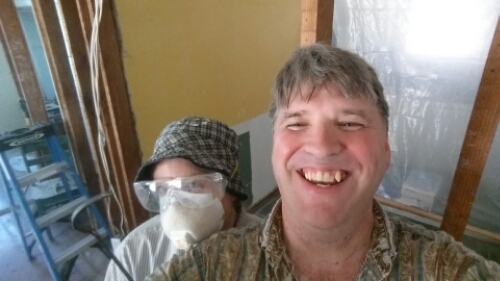 Me and my lovely wife (she is even lovelier without the mask) working on our house. This is not just painting a room, this is reconstructing the rooms to our specs and then getting them ready to paint. Working on the house is a lot of work, but it is fun too. Briget has really taken a shine to busting down plaster, too bad we are running out of plaster to remove.